When it comes to making dramatic cosmetic changes to the smile, many patients are approached with the idea of using porcelain veneers. 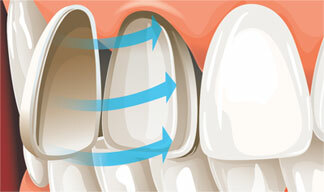 Veneers are very thin pieces of ceramic that are made to improve the smile by covering imperfections. They are fabricated to match the existing teeth and bond directly to the tooth to disguise discoloration, misalignment, and broken enamel. They are often an ideal solution and have become popular due to their versatility and simplicity. When it comes to the creation and placement of custom porcelain veneers, patients should only trust a dentist with a strong attention to detail and a high degree of technical skill. Drs. Kosta and Kristen Adams have years of experience in providing patients with veneers, and they focus on each specific case. Every patient’s smile is unique, and our team ensures we do everything possible to enhance the positive characteristics of every patient’s smile. Will porcelain veneers look natural? Yes! Porcelain veneers are ultra-thin and are bonded over natural teeth. They are virtually undetectable in a patient’s smile. Unlike natural tooth enamel, they are also stain resistant, and the material closely mimics the shine and appearance of enamel. They are not only beautiful but strong, and are unsurpassed by other restorative solutions such as dental bonding. When patients take great care of their veneers, they will find that they can last a decade or longer. Drs. Kosta and Kristen Adams use high-quality porcelain and strong bonding materials to allow patients to lengthen the lifespan of their veneers. Porcelain can still crack and chip, so it is important that patients avoid chewing on hard foods and objects and wear a mouth guard at night if they experience unconscious clenching and grinding of the teeth while they sleep. Patients who do damage their veneers can have them replaced when necessary. Are you considering the benefits of porcelain veneers? Do you want to find out if you are a proper candidate for them? If so, now is the time to contact the team at our office in Sacramento to determine if your smile could benefit from the placement of these versatile restorations. Lumineers are ultra-thin veneers made of a proprietary material that is strong and translucent. Because they are so thin, Lumineers can usually be applied with no numbing or drilling. This low-prep method conserves natural tooth structure, and there is no post-treatment sensitivity. Although most patients are thrilled with their new smiles, results are reversible without harm to teeth. Lumineers have an extremely natural look and feel, and with good oral hygiene, they can last 20 years or longer. Schedule an appointment with Dr. Kosta Adams or Dr. Kristen Adams to find out if Lumineers are right for your smile.